Every morning, Patricia (Trisha) Polacco wakes to the sounds of singing birds on her old Michigan farm. She goes downstairs, pours herself a cup of coffee, and then plays an antique music box, enjoying its magical beauty. She then sits in her favorite chair, rocks, and rocks, and dreams of stories, old and new, that she can tell to children through her words and her drawings. 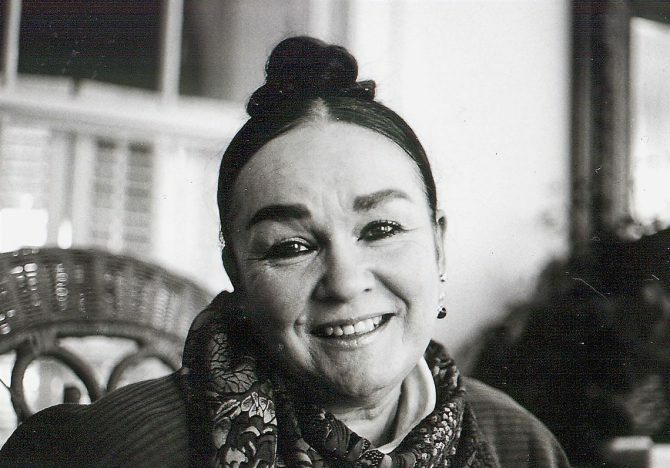 Patricia Barber Polacco came from a family of storytellers. She was born in 1944, the daughter of a teacher and a salesman turned talk show host. Trisha's parents were divorced when she was only three years old. She, her mother, and her brother went to live on a Michigan farm with her grandmother, whom the children called by the old country name for grandmothers: Babushka. In the summer, the kids would go to visit their father's family, Irish immigrants whose lilting voices surrounded everyone with warmth and comfort. Trisha's babushka was a wonderful woman whose gentle ways and common sense worked a magic on the shy, young girl. Some of her most famous books came from those years with Babushka. Stories woven from Russian and Ukranian Jewish roots were shared easily, along with smiles, tea, hugs, and Thunder Cake from beloved Babushka. When the kids would demand to know if a folktale were true or not, Babushka would wisely reply, "Of course, it's true. But it may not have happened." Later, Trisha, her mother, and her brother settled in Oakland, California, where her mother, as a teacher, was one of the founders of that community's Head Start program. You can see Oakland's influence in Trisha's works. Oakland was and is full of people of all different colors and customs. Her best friend growing up was an African-American boy. When Trisha creates neighborhoods from her imaginings-as in Chicken Sunday, she peoples them they way she would like to see them: all ages and all races, living and sharing together in harmony. Although Trisha was a natural storyteller, she had a very hard time in school, especially with reading and writing. It took a special teacher who understood that she had dyslexia and could not learn the same way as other students to help her understand her potential. She wrote Thank You, Mr. Falker as a tribute to the teacher who changed her life. Unlike many authors and illustrators of children's books, Tricia did not begin with a career in publishing. Instead, she studied how to restore old and precious religious icons. She traveled to Australia, England, France, and Russia to learn her craft. She did not begin illustrating until she was 41-years-old! Trisha Barber married twice. She had two beloved children with her first husband. Her second husband, Enzo Mario Polacco, is a chef and cooking instructor. She chose to take his name in honor of his family, some of whom died in the Holocaust. She has also honored Jewish themes in many of her works, including Tikvah Means Hope, The Butterfly, and The Keeping Quilt. She preserved a treasure from Ukranian folklore with her retelling of Luba and the Wren. After her mother died and her second marriage ended, Trisha finally left Oakland. She remembered those short years on the Michigan farm as an amazing time. She wanted to go back home, and that's exactly what she did. Today, she lives in her grandparents' house, which she fills with friends, old and new. She passes on her gifts not only through her books, but also by hosting storytelling festivals, teachers' retreats, and writing seminars. In her hometown of Union Hall, Michigan, she's founded the Gaw Center for the Arts, named in honor of her mother's family. If you would like to learn more about her, she has written an autobiography for elementary school students, called Firetalking. If you have a CRRL library card, you can get good information for reports from Biography in Context, one of our research databases. Author and illustrator Patricia Polacco's stories are heartfelt, and carry a lesson with every word and every folk art-inspired picture. A single china cup from a tea set left behind when Jews were forced to leave Russia helps hold a family together through generations of living in America, reminding them of the most important things in life. At first, Trisha loves school, but her difficulty in learning to read makes her feel dumb, until, in the fifth grade, a new teacher helps her understand and overcome her problem. View more books by Patricia Polacco. Patricia talks in depth about the family memories that went into When Lightning Comes in a Jar. A friendly biography and answers to questions that kids asked the author. Dr. Vandergrift of Rutgers University looks at what Patricia Polacco's work teaches children about their roles in the world through her celebration of women's lives. Part of a section celebrating children's authors. The author's own homepage gives readers a chance to get to know her better through "A Visit at Work," "Who I Am," "My Start," and "Inspirations." "Fun Stuff" has color-ins, postcards, quizzes, puzzles, bookmarks, mini-posters, a video gallery, and more. Also includes contact information. Patricia tells her life story in her own brief words. Watch the interview online or read the transcript.